I'm a massive thing of all things Hobbit, written by J.R.R. Tolkien and adapted into an awesome set of movies by Peter Jackson, and one part of this brilliant tale that I'm really fixated on are the accessories and the weaponry that each character has. Bilbo Baggins is not a Middle Earth character that you'd ever think would have a sword but this initially unadventurous Hobbit is dragged into an adventure which requires just a little more than the skill he professes to have with conkers! After an encounter with 3 trolls, the whole company of 13 dwarves, Bilbo and Gandalf the wizard find the troll lair and a number of magical swords. This is where Bilbo acquired his sword although the dwarf, Balin, soon pointed out that this one was more like a letter opener. Indeed it is. Sting is really a dagger but because Hobbits are small, for Bilbo it was a perfect sword size. 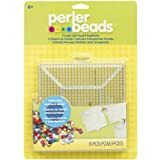 You'll need 1 large, square pegboard to work this fused bead pattern. You can get two of this design onto one board and you'll see how this is done in an image further down the page. This mix of beads has many of the shades that you'll need for this project. It has the blues and whites needed for the blade of the sword plus the clear beads for the handle and some gold ones too. You'll still need brown and gray which you can find in the Pet Mix of beads. Most swords do not have blue blades. But the Hobbit sword is special because it was forged by Elves and has magical properties which means that it glows blue whenever Orcs or Goblins are nearby. I wanted to make a Perler fused bead sword that really focused on the magical blue blade - you can make yours whatever color you want. Or make two swords, one with a blue blade and one with a silver blade and stick them back to back! You need to use a large, square Perler pegboard because the size of the sword fills the entire height of the board. These three images (click on the smaller thumbnails to see larger sizes) show you how to work first a darker blue outline for the blade, then a lighter blue section and white down the middle of the blade. Once you've marked out the outline which should take you up to the 18th peg up on the board, it's easy to fill in the other colors. Consider swapping some standard fused beads out in the pattern for some glow-in-the-dark beads instead. The Winter Mix I showed you above comes with one glow-in-the-dark blue bead but this tub has lots of glowing colors which are perfect to emulate that magical, glowing blue blade of Bilbo's sword Sting. Another way to get a rather magical look and feel to your fantasy sword is by adding some glitter fused beads into the project instead of the standard plain beads. These step by step images take you through how to make the guard, hilt and pommel of Bilbo's sword. I based my design on the actual replica movie sword of Sting that you can buy. So the design is the nearest that I could come up with to reflect how Sting looks in a pixelated fused bead design. I chose gray beads to first work the curved (looks like a bird flying) outline of the guard and filled it in with white beads but you could use silver beads instead. The hilt or grip can be worked in a variety of browns. Here I've used two shades of brown and clear beads to get a good contrast. Think of using brown or gold colored beads to make this part. Lastly comes the pommel at the top which uses gray and white. 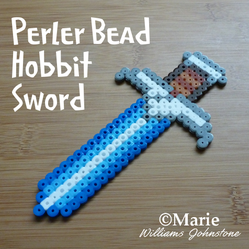 When you've worked steadily through the pattern diagram, you'll have completed your very own Perler Bead Hobbit sword. You can make up to 2 of these swords on a single large square pegboard. Why would you want to make more than one? Because you're a LOTR or Hobbit Geek like me! Because you're going to make a magical glowing blue version and an ordinary version. Because you may want to make more for friends. Or because you want to stick two back to back for a super strong sword that you can play with. It makes a pretty nice size once finished and I have mine stuck up on my refrigerator as a kitchen magnet which is very easy to make. You could turn this into a necklace (although it would be a bit large) or a hanging ornament even. If you loved this craft, you should also see the rest of my Hobbit Themed Perler Bead Patterns. It is really easy to make magnets out of completed Perler, Hama and other fused bead projects. Just buy an adhesive magnetic sheet. Simply cut a piece to size to fit on the back of your completed pattern, remove the backing sheet and stick it on. I make lots of magnets this way and they make great party favors too. Perler, Hama and fused beads can make fun, cute and modern pieces of jewelry. This article tells you how to make brooch pins, earrings, necklaces and other handmade items.